With North Africa on the brink of being won back from Rommell, two clever chaps in British Naval Intelligence were given the task of inventing a deception that would make the Nazis believe the Allies' next goal was to liberate Greece and Sardinia (and not the blindingly-obvious Sicily). This is the remarkable story of what they dreamt up, drawing on the very latest historical records as well as previous semi-fictional accounts, to add colour and dramatic tension to this little known, yet crucial episode from World War Two. 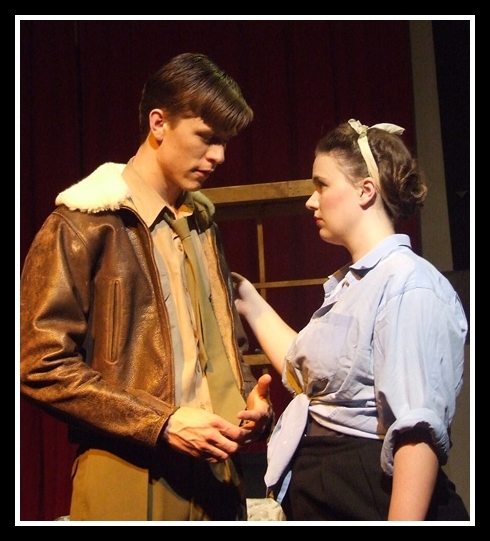 The script, incorporating many recently released secrets, was first developed during 2008 with the aid of funding from the Arts Council of England and The Library Theatre Co. of Manchester. 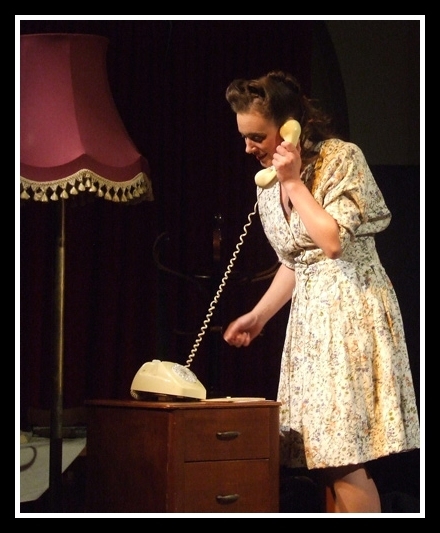 The Cast was:- Thomas Frere; Guy Hargreaves; Philip Dinsdale; Alison Darling; Victoria Brazier. OPERATION : MINCEMEAT received its world premiere on February 22nd 2010 at the fringe festival in Adelaide, South Australia. Read the great, uneditted review from the Adelaide press below. (Adelaide show picture above, rehearsal shot below). "Operation Mincemeat" is a charming, smart and funny play based on a true story of deceit and misdirection during World War II. The real Operation Mincemeat helped persuade the Nazis to believe that, following their invasion of North Africa, the Allies intended to invade Greece and Sardinia, rather than Sicily. But the play, concentrates on the oddball boffins behind the planning of the audacious scheme. Topped by a respectable cast, a good script by Simon Corble and comfortable direction by Bronwyn Palmer, it is, in its quiet, classical British war movie style, a fine production. Although the piece is fun, fun, fun, it is clever enough to manoeuvre away from allegory and into the definite, where possible, which ensures that it remains cute but never settles into a rhythmic sitcom. The two male leads Matthew Taylor (Montagu) and Andreas Lohmeyer (Cholmondeley) are tremendous as the men who conceive the scheme to transform an unknown corpse into the fictitious Major William Martin – provided with an completely fabricated former life (theatre stubs, personal letters etc) – and leave the seemingly drowned man, and his bogus invasion documents, off the coast of Spain, to be picked up by a Nazi spy. Sophia Bubner is particularly convincing as the intelligence secretary Pamela, who provides much of dead man’s back story as his hoax fiancée. "Operation Mincemeat" is blessed with many bright moments, nice lines and colourful characters all wrapped up in an affable and entertaining package. It’s definitely worth the entrance fee. THE TWO NAVAL INTELLIGENCE OFFICERS (WHO REALLY WERE CALLED MONTY AND CHUMLEY) ARE GIVING BIRTH TO THE IDEA OF "THE MAN WHO NEVER WAS"
Monty You remember that idea you had? Monty The one that would never have worked. Chumley The field’s still quite wide. THE PACE SLOWS A LITTLE. Monty You had the completely ludicrous idea of dropping it with a man whose parachute failed to open – so that, if it fell into the hands of the Germans they could not possibly suspect a deception and we’d know that the transmissions were surely theirs and not resistance. Chumley Yes, all well and good, but the rather massive hole in the plan, if you remember, was in persuading a chap to do the decent thing for his country - and jump! Monty Quite…. But if that chap were already dead. Chumley…He could be as brave as you like.